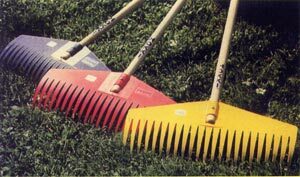 This rake is so designed that its long,correctly shaped prongs make it easy to use even in long grass or on uneven ground. It won´t clog up with grass and leaves. 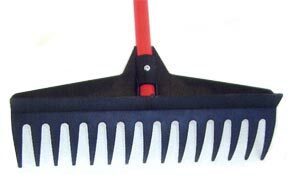 The HOKKI leaf rake is a very light rake made from special weatherproof plastic,withstanding temperature changings (-40°C). 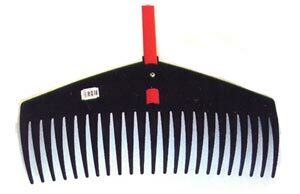 This model is also an exellent gravel and lawn rake. Rake blade is 43 cm (17 in) wide. edge with long very stiff prongs. Made from the same raw material as the leaf rake. Rake blade is 36 cm (14 in) wide. and are fitted with a hanging ring for neat and easy storage. Handle lenght 150 cm (59 in), diameter 22 mm. even long grass and varying terrain. 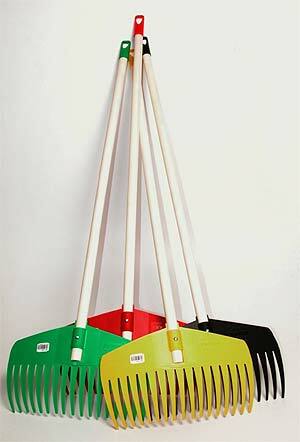 Grass and leavs won´t stick to the rake. on balconys and in greenhouses. lenght 85 cm (34 in), diameter 24 mm.